We have put together a handy guide to ensure purchasing and redeeming your Online Gift Vouchers is a hassle-free process. Online Gift Vouchers can be purchased from £10 up to £250. Once you've chosen your amount, please wait for a very short time whilst the page confirms the amount you've selected. Please do not add aditional information into the 'Postman/Courier Instructions' area within the checkout page. Any personalisation should be added at the personalisation screen shown above. Once you've finally completed your purchase you'll receive our 'Order Confirmation' email and your 'Gift Voucher Confirmation' email(s). Your Gift Voucher email(s) should be received no more than 30 minutes after you receive your initial 'Order Confirmation' email. If you haven't received your 'Gift Voucher email(s)' within this timeframe and have double-checked it's not sitting in your email's spam folder(s), please contact us. 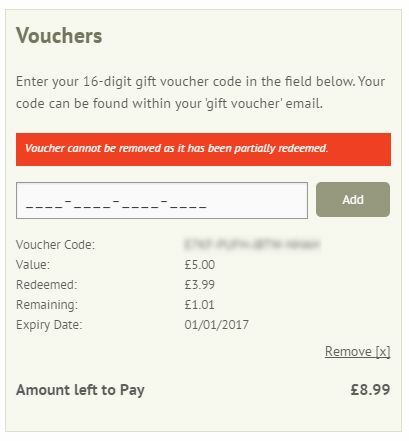 After you've added the items to your shopping basket and you're ready to make your purchase, proceed to the checkout and enter your unique 16-digit code into the 'Voucher Code' field within the 'Vouchers' section of the checkout page. Click the 'Add' button. Once you've entered your 16-digit voucher code successfully, you'll see the details of this voucher, i.e. voucher code, value, amount redeemed, amount remaining and an expiry date. 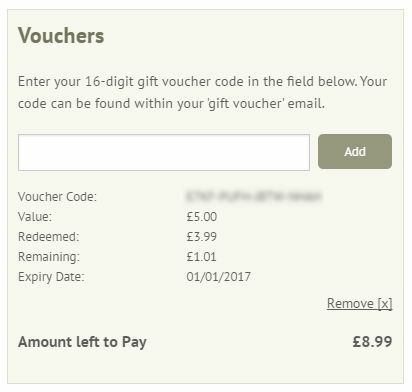 If you have more than one voucher code you wish to use, enter your unique 16-digit code into the 'Voucher Code' field in the 'Vouchers' section of the checkout page. Click the 'Add' button. 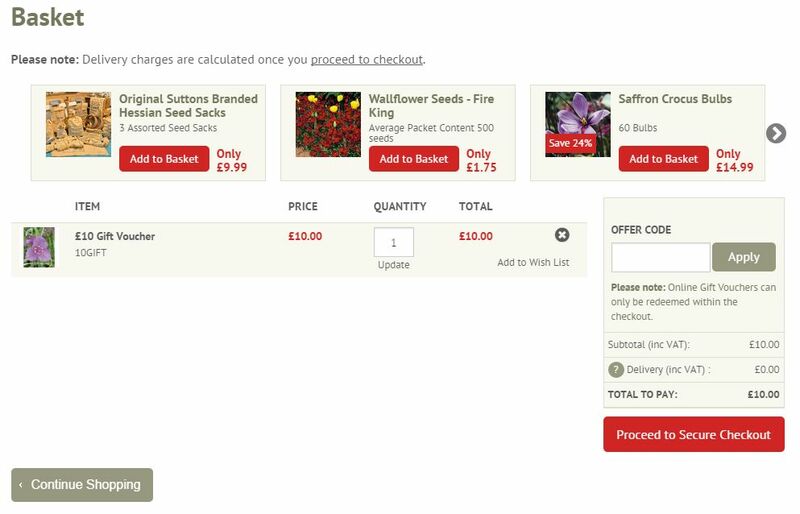 As long as you have sufficient voucher amounts remaining to cover the cost of the total goods in your basket, simply click the 'Complete Order' button to finalise your purchase. Any vouchers which have been partly redeemed will remain on your account until such time that they have either been used or expired. The screen below simply confirms the message you will see if trying to remove a part redeemed voucher. 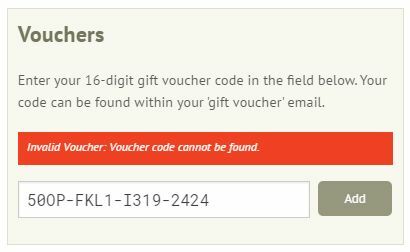 The following conditions apply to Online Gift Vouchers which have a 16-digit code containing letters and numbers. Online Gift Vouchers cannot be used to pay for Online Gift Vouchers or the paper alternative. Online Gift Vouchers are sent by e-mail to the account holder who purchased the voucher and will need forwarding to the recipient or printing. Online Gift Vouchers have no cash redemption value and are not transferable, assignable and cannot be exchanged. Any unused gift voucher funds remaining will be retained within the recipient's account and show at the checkout page when logged in. If the order exceeds the amount of the Online Gift Voucher funds remaining, the balance must be paid using a credit/debit card. All unused portions of Online Gift Vouchers will expire within 1 year from the date of issue. The expiry date will show at the checkout page when logged in. Normal suttons.co.uk terms and conditions of purchase and use of the suttons.co.uk website apply. One or more Online Gift Vouchers can be redeemed against an order. 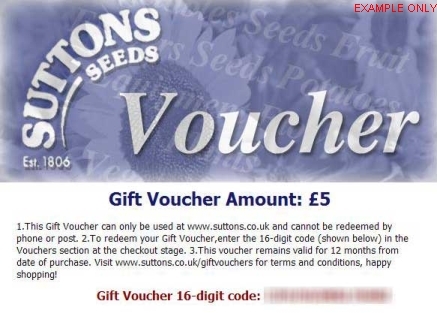 suttons.co.uk is not responsible for any Online Gift Voucher that is lost, stolen, destroyed or used without permission. Online Gift Vouchers are non refundable purchases. 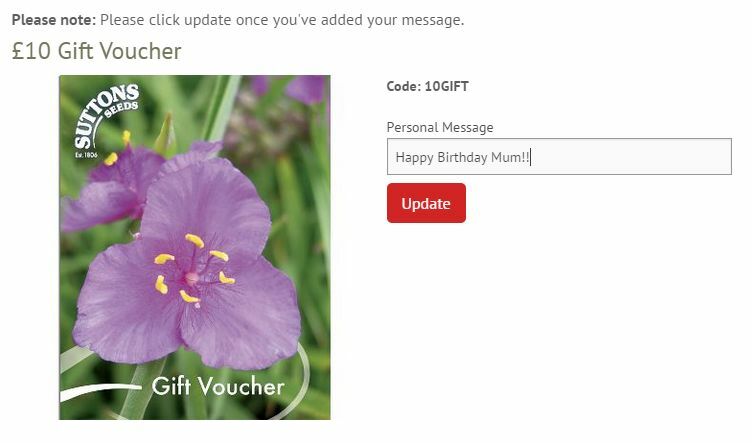 Offline Gift Vouchers cannot be redeemed on the website but must be redeemed by either post or phone. suttons.co.uk Online Gift Vouchers must be redeemed on the suttons.co.uk website towards the purchase of eligible products listed in our catalogue and sold by suttons.co.uk.